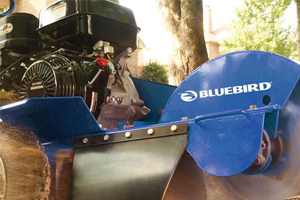 BlueBird, which is now part of Husqvarna Group, has been manufacturing quality turf maintenance equipment since 1960. 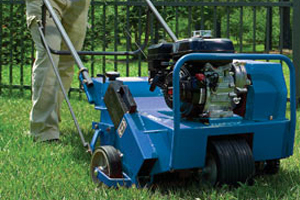 Their innovative line of aerators, dethathcers, edgers, seeders, stump grinders, and sod cutters are well-known in the commercial landscape industry. 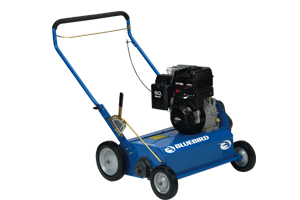 BlueBird's line of commercial aerators include walk-behind and tow behind aerators up to 48 inches wide. Options are available powered by Honda or Briggs & Stratton engines. Type of aerator choices include Core aerators, Open Spoon Tine Core, and Closed Spoon (tow-behind models). We offer walk behind and tow behind BlueBird dethatchers as well. Models are avaialbe with either Briggs & Stratton or Honda engine. Also, select BlueBird dethatchers come with a bagger kit included for quick thatch removal cleanup.